Flexible, fun, & festive session, perfect for all. Paint your own ceramic decorations ready for the Christmas tree. Our holiday ceramic painting workshops are a great idea as an alternative work's do, festive team fun day or family gathering this Christmas. Design and paint your own festive ceramic decorations to brighten up the tree this year. For our Christmas ceramic painting session each person gets to paint variety of decorations - choosing from an assortment of ceramic baubles, stars, trees, bells, or snowflakes. A great team building activity, or chance to sit down with friends and catch up over crafts and mince pies at home! We will provide a range of ceramic paints and pastes as well as the ceramics for you to work with on the day. Our workshop leader will be on hand to illustrate some top tips as well as providing lots of ideas to get you all inspired. 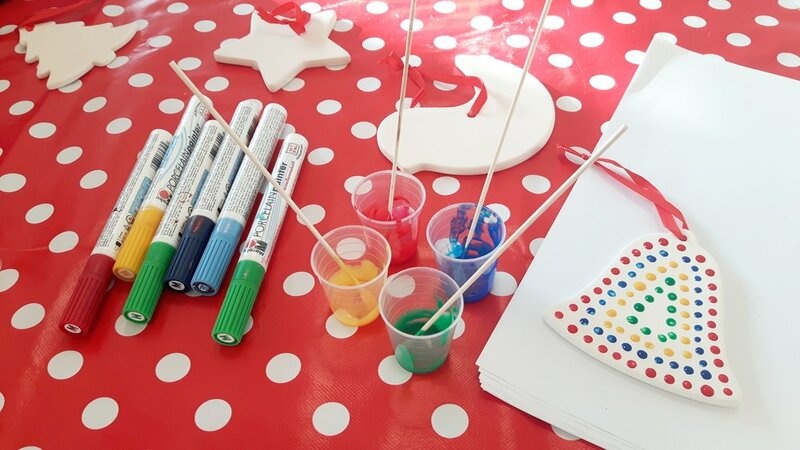 This session is one of our most popular Christmas craft workshops as it can be tailored to a variety of settings, timings, audience and works brilliantly for drop-in events. Group Size: Minimum charge for less than 10 people, no maximum. Suited To: Anyone! This session involves painting, drinking tea (and sometimes something a little stronger!) and lots of fun. Suitable for all. This workshop needs to take place in a private venue to allow for drying time (and clearing up!). Assortment of festive shapes to paint. Rainbow of paint colours to inspire you, plus the opportunity to mix up that perfect tone. Flexible & adaptable for different lengths, set up, audiences and more. This Christmas activity works well for promotional events, staff parties, festive fun days and in store experiences too.